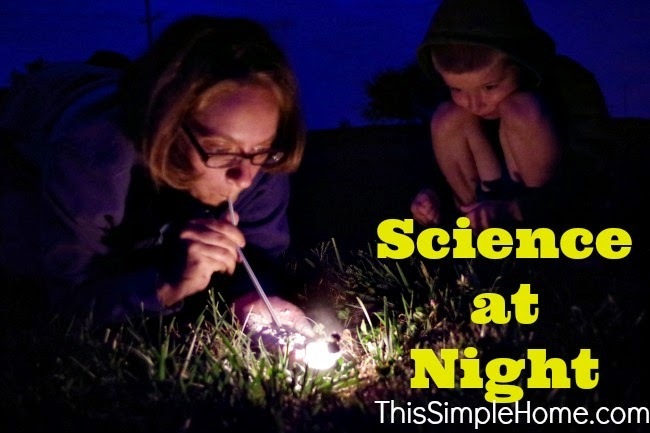 Eager to introduce my own children to the "night hike" experience, I gathered the needed supplies for the nighttime science experiments before going to family camp this summer. The evening rain kept us from walking to the special spot that we had chosen during camp. 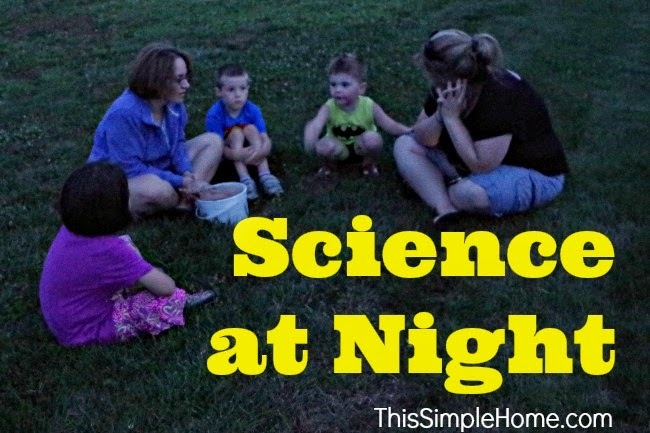 It was a bit disappointing, but my sister, nephew, and friend came to visit the next weekend, so the children were able to stay up late for some fun science experiments. Discussed that when one of our senses (vision) does not work well, the other senses work even better. Put on your "owl ears" to improve your hearing by cupping your hands around your ears. You will hear nighttime sounds better. Discuss them. I did not do it this time, but in the past I used film canisters (available from places that develop camera film) and placed strong-scented items inside the children would recognize. Play-Doh, Vicks Vapor Rub, cinnamon, citrus fruit, and others are good options. Skip the skunk scent. Once it is darker, light a match and light a candle. Before doing so, explain that it will seem like the brightest match in the world. Have the group cover one eye and stare at the candle. It might remind them of being a pirate. After discussing a bit about pirates, explain one reason (from what I've been told) pirates might have worn eye patches was so they could see when they went under the deck of other ships to steal. All they would need to see better is switch the eye patch to the other eye. Have them do so, too. At night it is more important to see shapes than color. Our eyes' special design helps us with this. Cones work to enable us to see color. Rods enable us to see shapes. We pulled out my quartz rocks (which my husband just learned have stayed with me since 1998). By rubbing-NOT hitting- the quartz rocks together, they create LIGHT. When the crystal bonds in the quartz rocks are rubbed together, the bonds break creating light. This is called triboluminescence: Light from breaking bonds. Maybe you've heard of bioluminescence? Some mushrooms, eels, and fireflies all are designed to create light...light from life. Please note, to create triboluminescence with quartz rocks, you must rub the rocks together very quickly. 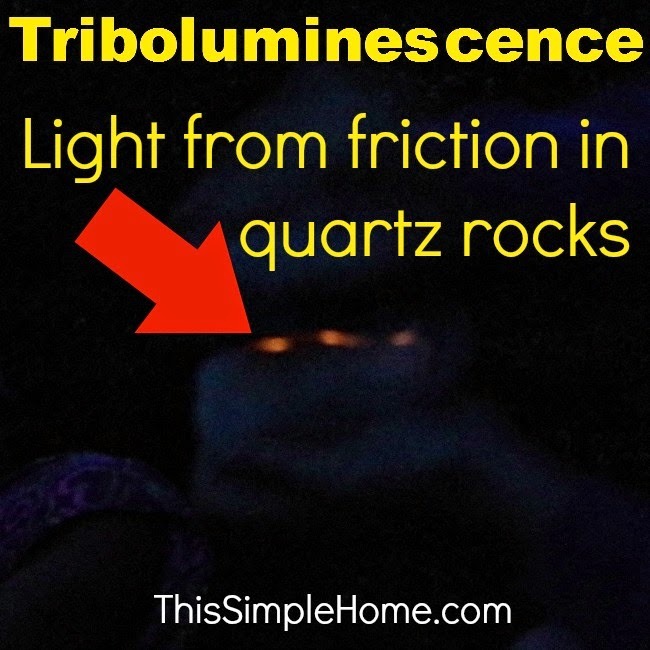 You can make sparks from banging the rocks together, but that is not triboluminescence. The photo below shows, in the fuzzy picture, triboluminescence. Can you see my hand holding a rock? The light shows on the bottom rock, another rock is on top, held by my other hand. If it is really dark, you can also use wintergreen Lifesavers to create triboluminescence. Remind everyone to chew with mouths wide open! The sugar crystals break apart when chewed creating the triboluminescence. Individually wrapped Lifesavers are much harder to bite than the ones that come in the roll because they are larger. We learned the hard way. At this point it's time for highlight: fire. Please use caution. This is an experiment for adults to complete. Also, consider wearing something (like a bandanna or backwards hat) to protect your hair. Place a handful of flour in the palm of your hand. First, try to light the flour on fire with a lighter or match. It may burn for second, but it doesn't really create fire until you spread out the surface area of the flour. Place your hand directly behind the candle's flame. Using a straw, blow air into the flour. 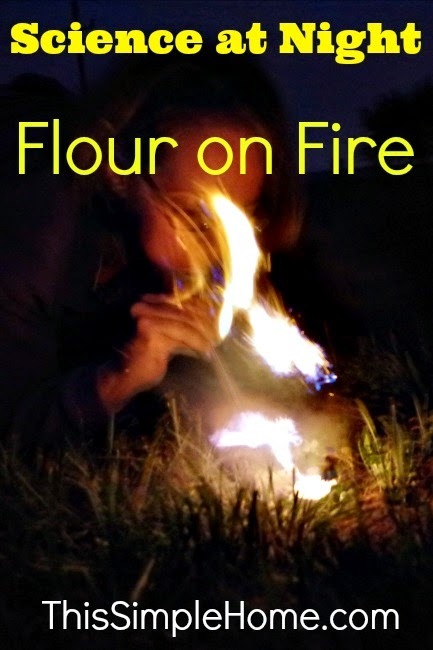 As the flour goes into the air, the pieces that go to the flame will catch on fire. If the wind/flame/flour/you do not cooperate, you may only see a few sparks...or you could catch your eyebrows, hair, or grass on fire. However, done well, the flour will catch on fire and create a burst of flame. In the image below (and above) the candle is on the ground. My left hand is not on fire; instead it holds the flour. My right hand keeps the straw still and aims the air from the straw into the flour. Have you heard of the Great Fire of London? It began in a bakery. Just as a newspaper won't burn easily, if you separate the pages and spread out the surface area of the paper it will burn very easily. How did I learn all of this? 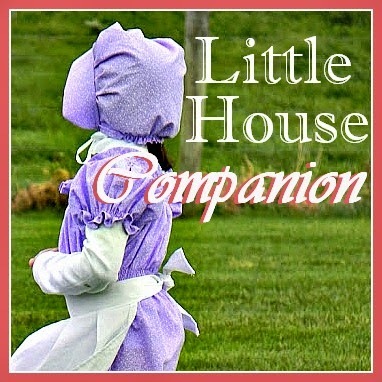 I taught it to middle schoolers every week for one and a half years. In May of 1998 I graduated from college with a degree in elementary education and the all-important Pennsylvania teaching certificate. But I still couldn't get a classroom job where I was confident I could live and teach for a school year (or ideally for many years). I had been offered a job...without an interview in a school system that was less than ideal...in a section of the country I knew I would feel/be a foreigner. 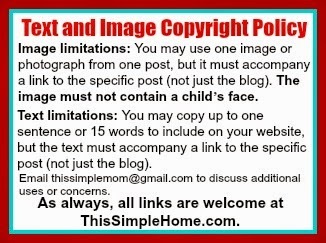 If you are interested in more science ideas you can do right at home with children of all ages check these out. During the month of August, I saw an ad in the newspaper. They asked for people who enjoyed the outdoors and loved children. 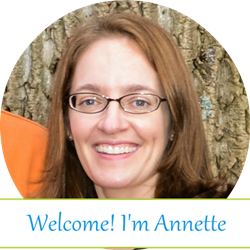 Within a week or two, I packed up and moved to New England to be an environmental educator with Nature's Classroom. It was the ideal first teaching job because it made me a much better teacher. Schools brought their students to us, one week at a time. During the very intense weeks, we spent from 7 a.m until 9:30 p.m teaching the students indoors and outdoors. We also ate with them, but thankfully they slept with teachers and chaperones from their own schools. After teaching at Nature's Classroom for three seasons (1 1/2 years), I taught in the regular classroom until my oldest child was born. It made me a better teacher. 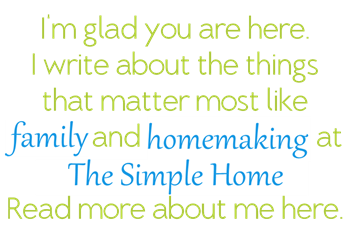 If you like this post, please share it and This Simple Home with others. That's a very cool science experiment. I am not a big science fan but I do admire interesting experiments. Neato! My DH was a physics and biology teacher before going to work for the university as a curriculum specialist. I'll have to share this with him. An experiment with fire, why yes my boys would love that! 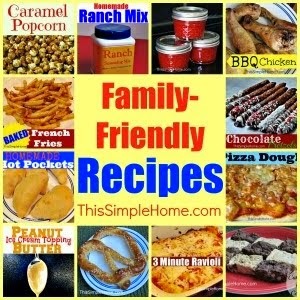 Summer fun and the making of great memories!